You are all invited to attend our Christmas/Pot-Luck meeting on Saturday, January 9 at the home of Linda & Dave Kolassa in Westernville, NY. We will eat at 12 noon, so bring a dish to pass and join us. We will also have a gift exchange, so bring a wrapped "regifted item" you have left from Christmas for our exchange. It is always fun! We will also have business to conduct: upcoming specialty shows for 2010 and even though we didn't do it in the Fall, we will have elections as well. So email me (stjohnslyonsny@eznet.net) or Linda Kolassa (dak9557@dreamscape) for direction to her home. And please RSVP Linda if you plan on attending (weather permitting). Look forward to seeing all of you there!!! of angora fiber. Once again we were delighted to be highlighted on Laura Hand's noon time show on Channel 3 (Syracuse). 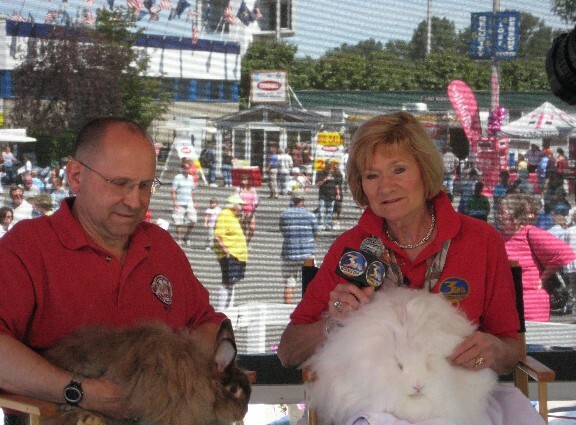 Jack Bailey, President of the New York State Angora Club (asisted by Linda Kolassa), brought two Angoras for the interview. The white English Angora Sr. Doe, which won BRIS, and a Satin Angora.